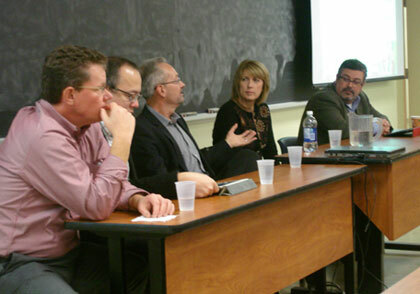 The UNB faculty of computer science, in collaboration with the New Brunswick Information Technology Council (NBITC), hosted a panel discussion last week featuring five high-profile New Brunswick entrepreneurs and leaders in the information technology industry. Chris Boudreau, CEO of ClinicServer; Mary Goggin, Co-Founder of Accreon; Dave Grebenc, Co-CEO of Innovatia; Keith McIntosh, CEO of PQA; and Larry Sampson, CEO of NBITC shared their experiences as IT entrepreneurs and answered audience questions. The approximately 50 attendees included students and faculty from the Computer Science, Engineering and Business Faculties at UNB. This event was offered through the Computing Science Creative Space (CS Square), a project of the Faculty of Computer Science that aims to foster entrepreneurship, innovation and peer learning among Computer Science students. Ali Ghorbani, Dean of computer science at UNB, says he hopes that by exposing students to these successful entrepreneurs and leaders in information technology, they will be inspired to pursue their own entrepreneurial dreams and provide vital first-hand experience about the process. For inquiries, please contact Dr. Ghorbani at cssquare@unb.ca.